A George Smith Towing sign sits behind a fence at a private lot at Broad Street and Washington Avenue in South Philadelphia. Last week, local residents filmed a tow truck from the company at this location, alleging the operator may have used a movable sign to trap drivers into having their vehicles towed. Parking in Philadelphia can be expensive. And, those costs skyrocket if your car is towed. Paying hundreds of dollars to get your wheels back after a night out in the city is bad enough, but it's a lot worse when your perfectly-legally-parked car is towed anyway. 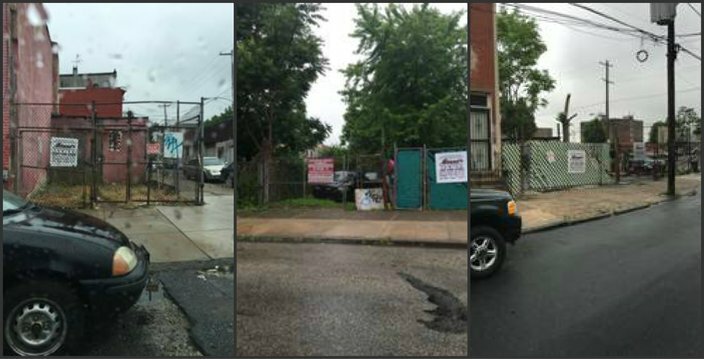 Last week, a vivid example of this potentially illegal behavior made the Facebook rounds after a local resident filmed a truck from Philadelphia towing company, George Smith Inc., seemingly using a movable sign at a private lot to trap drivers into having their vehicles towed. In Philadelphia, scams like these are widely reported, and they are a practice that city councilmembers are looking to end with the help of an online, searchable list of all properties that shows exactly where towing companies are permitted to haul away illegally parked cars. Eric Bodzin, legislative aide for Councilwoman Maria Quiñones-Sanchez (D-7th District), said he's seen a variety of towing scams operating in the city. His boss, however, has a plan to fight back. Examples of allegedly illegal towing company signs posted at vacant lots throughout Quiñones-Sanchez’s district. Bodzin has researched illegal towing in Philadelphia and found all types of scams. The alleged bait-and-trap scheme caught on video at South Broad Street near Alter Street in South Philadelphia is just one type. Bodzin has a "whole stack" of complaints on his desk detailing other allegations of scams — many of which have been confirmed as illegal ruses by the councilwoman's office. "This is a long-term problem that we are looking at," he said during an interview on Tuesday. Bodzin said he even has confirmed cases of scams where city tow truck operators have used their trucks to push vehicles into illegal parking zones in order to then tow them. The towing companies' compliance with city regulations on signage is also a problem, Bodzin said. According to the Philadelphia Code and Home Rule Charter, towing companies that seek to remove a vehicle from a private lot, property or driveway must have a sign that "can be easily seen by the public" and is at least 36 inches by 36 inches large —18 inches by 18 inches for single-family residential properties. The signage must include information noting that parking there is, indeed, prohibited; the name of the company towing the vehicle; that vehicles will be towed once authorized parking time has elapsed; and the charges involved with the tow. City regulations limit towing charges to $175 for vehicles under 11,000 pounds — most passenger vehicles — and $25 a day for storage. Bodzin said he's seen examples of illegal signs — including incorrect sizes, display of costs higher than allowed by law and/or signs placed at vacant lots where legally parked cars end up being towed. "This has been a recurring issue," he said. 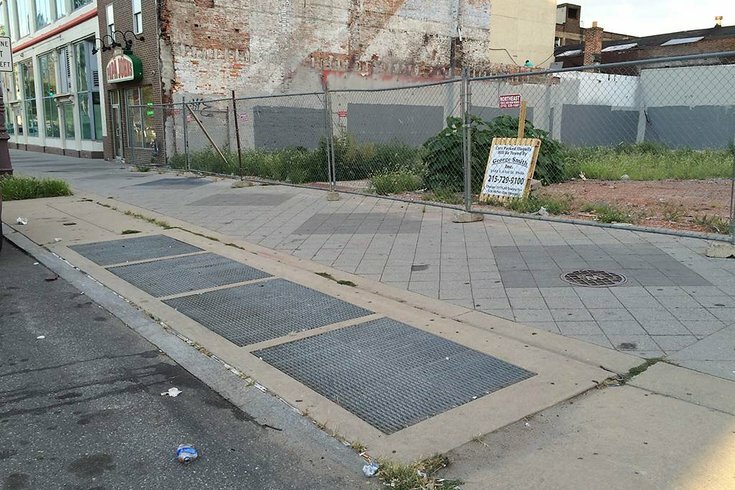 For example, he pointed to vacant lots located between American Street, Lehigh Avenue, Front Street and York Street in Kensington, in Quiñones-Sanchez's district, where signs for towing companies can be found on lots where parking is legal and where the towing operators may not even have a legal agreement with the property owners. "I'm sure, at each of these properties, the owner doesn't have an agreement [with a towing company]," said Bodzin. "You can't just go around posting signs on vacant properties. That's a violation of the code." Even if a towing operator has an agreement to tow cars at a vacant lot, he said, they don't have the authority to remove cars parked legally on a city street if there is a curb. Towing operators can only move cars, Bodzin said, that are parked on private property – a city street isn't private property — or blocking a driveway. A curb isn't a driveway, he pointed out. "We've seen plenty of copies of what these [towing] agreements look like and there's nothing in the agreements that allow a vehicle to be towed from in front of a person's property," he said. But what enables tow truck operators to be able to manipulate the system to their advantage in this way? According to Bodzin, much of the blame rests on the city's removal of "ticket-or-tow" legislation in 2013. In 2010 — following a 2009 City Controller investigation into towing operators in the city — then-Councilman Jim Kenney proposed a bill that required any tow truck operator to contact police or the Philadelphia Parking Authority so an officer or PPA agent could issue a parking ticket before the vehicle could be towed. That requirement was intended to ensure that vehicles were, in fact, parked illegally before they were towed. In December 2013, however, the requirement was removed and tow truck operators were given permission to take digital photos of a vehicle as proof that it was parked illegally. Photos showing the car parked illegally, the car's license plate, and the sign identifying that parking is prohibited are required before any car is towed. "To move a vehicle, snap a picture and haul it away, that's not opportunism, that's theft," Bodzin said. But operators routinely submit photos that don't clearly show why a car is being towed, he noted. "It's tow now, ask questions later," he said. "Very often, [these photos] are not definitive... The photos can be snapped in a dark alley and tell very little." 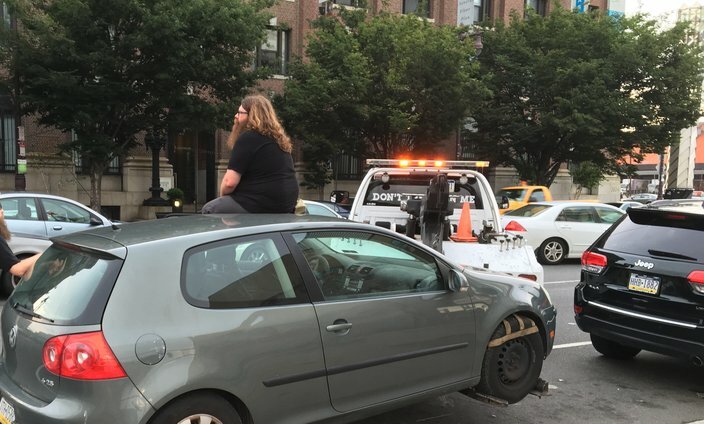 This photo shows Adam Malliet sitting atop his car in protest as a tow truck operator attempts to haul it from a space on South Broad Street in July. "But, that's not the endgame," said Bodzin. The other bills would create a citywide database of all private driveways, properties and lots where towing companies have contracts to tow vehicles. Right now, Bodzin said, tow operators are required to keep records showing all locations of their signs as well as copies of the contractual agreements with property owners. An online, publicly accessible database would cut down on signs being posted at lots where there are no contracts — including lots where signs are being moved —by allowing parking "violators" to confirm online that the tow was legal, Bodzin said. The bills would also require that a towing company's signage be inspected by a city office — which office would have this authority has not yet been determined — and then affixed with a sticker to note that the sign is legitimate. Under the proposed legislation, towing operators would "be required to register like any other company in the city." Currently, he said, Quiñones-Sanchez's office is working with the mayor's office, the Streets Department and City Council's Committee on Streets and Services to determine which city agency would be responsible for creating and maintaining the database. "We need to figure out how we can do this efficiently," he said. The bills are not yet on City Council's calendar for a vote, and Bodzin said it would require some city resources to build the online database. But he believes it's only a matter of time before all three of these bills appear before City Council. "They are still in the Streets Committee, but we are working with the city to figure out how we can do it," he said.